I love my natural Orange Wood Polish! Last summer I wrote about how to make your own basic wood polish. Today I thought I'd share a fun citrus twist on that recipe. Materials for making orange wood polish. To use, squirt about 5 drops onto a soft folded cloth (or old sock or flannel pajamas, #realtalk). Rub into a small area. Refold the cloth so that you can use a clean surface when needed. Repeat until you are done. Easy! 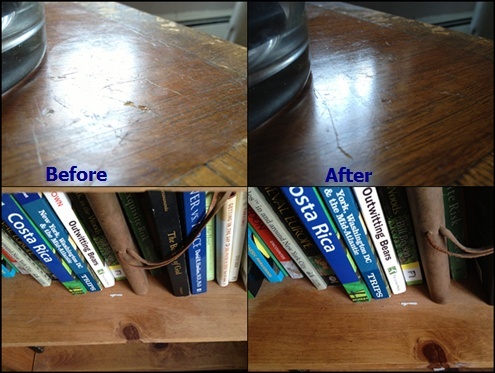 I polished my ratty "entertainment" table (above) and our bookcase. This orange wood polish actually makes me excited to give my wood some TLC, which is not something I normally think about. I usually draw the line at dusting because I'm selfish/ afraid of dust bunnies and have more fun things to do (#realtalk), but polishing wood is important because the oils keep furniture from cracking, allowing it to age gracefully like people who remember to use moisturizer do. This wood polish contains olive oil so be sure to store it out of direct sunlight, preferably in a dark cabinet. Do you have wood furniture? (I feel like in the IKEA age it's becoming rare.) How often, if ever, do you polish your wood furniture?